During the summer zucchini is so plentiful, so it’s important to find new ways to fix your zucchini to keep from being bored with your food. This recipe from one of our Genesis clients, Cindy Ussery, is a great way to add a flavor punch while adding more vegetables into your diet. Keep in mind, because they are not coated with the traditional flour or parmesan cheese, they will not crisp up in the same way as a true zucchini fry. Just be sure not to overbake them or they will lose their crispness. One serving equals 1 cup cooked vegetable, which is about 1 medium 8-inch zucchini. Preheat oven to 400°F. Line a baking sheet with parchment paper. Cut the end off the zucchini, then cut in half once lengthwise, then cut each half in half across the width (leaving you with four quarters). Slice each quarter into 3 “fries” lengthwise, making sure to leave some of the peel on each fry. 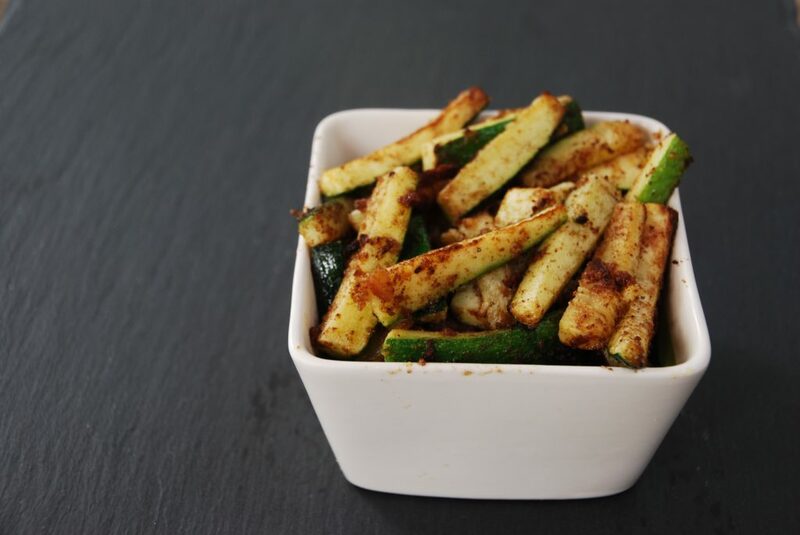 Place the zucchini into a large bowl, tossing gently with the oil, chili powder, salt and pepper.